Espalier, a French word derived from the Italian spalliera, which means “something to rest the shoulder (spalla) against,” is the art, or process, of controlling plant growth in a flat plane, usually against a wall or fence, or along a trellis. The term – pronounced “es-PAL-yer” or “es-PAL-yay”– also refers to the plant itself grown in this way. Originally it defined the trellis, or frame, the tree was trained to, but this meaning is no longer used. This horticultural technique trains woody trees or shrubs through pruning and tying to create two-dimensional plants, often in specific patterns. Because a plant pruned in this way uses far less space, it is ideal for small gardens where, and in narrow spaces where spreading trees or shrubs will not fit. When planted next to a south-facing wall, the slightly warmer microclimate (the wall radiates heat and provides shelter) may allow some plants or cultivars to be planted in colder regions than they would normally be able to survive or fruit (because the season is a little too short). Espaliered pear tree, RHS Garden Wisley, England. Today, espaliers are used primarily as decorative accents in the landscape. They function as living sculptures – but less involved than topiary – and are especially effective against blank walls. (Espalier differs from topiary in that pruning creates a structure or skeleton of the tree, while topiary only forms a shape or silhouette.) In winter the geometric form of the bare branches are especially noticeable and decorative. They can be used to disguise less-than-attractive walls or fences or to screen views of utility areas. Free-standing forms make elegant fences or unique vertical accents. 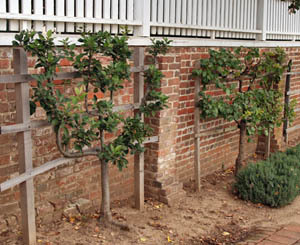 Espalier is much more popular in Europe than in the U.S., where it is also used in some commercial orchards to increase productivity. Freestanding espaliers: For ornamental interest at Keukenhof, Netherlands (L and LC). As a fence in the kitchen garden at Mt. Vernon (RC) and between parking lot and gardens at River Farm, American Horticultural Society headquarters, Alexandria, VA (R). This ancient practice may go back as far as the early Egyptians (tombs from about 1400 BCE have been found with paintings of espaliered fig trees), although many believe the Romans originated the technique. It was commonly used in the Middle Ages in Europe to grow fruit inside walled monastery gardens or castle courtyards without filling the open space. The classic European styles can be traced back to the 16th and 17th centuries where they were developed in such marginal climates as northern France and southern England for more practical fruit production. A young pear tree trained in the palmetto verrier style, Missouri Botanic Garden. Some plants adapt better to the techniques of espalier than others. The best candidates have long, flexible branches and ornamental flowers or fruits. Fruit trees are the most common subject. The intensive pruning directs energy away from vigorous vertical growth into the shorter, lateral fruit-bearing spurs, resulting in heavier yields than on ordinary trees. Because they are less susceptible to breaking branches, espaliered trees can have an incredible life span – some espaliered apple trees are still producing fruit after 150 years! Some other advantages to espaliering fruit trees include being able to grow several different cultivars in the space of a single normal tree for greater diversity in fruit types and cross-pollination requirements; the trees bear earlier and for a longer time with deeper fruit color; fewer pest problems as air circulation is enhanced and any needed treatments are more easily applied; and harvest is much easier. Espaliered trees can grow very old. Fruit trees that bear fruit on long-lived spurs are easiest to espalier. 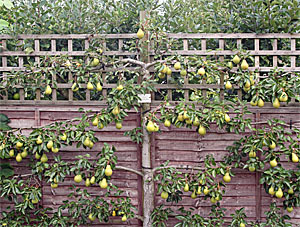 Apple and pear trees are the traditional espalier subject because their spurs live for years producing fruit (although certain cultivars are better than others) and they have supple, easily trained new growth, but other fruit trees that sometimes are espaliered include fig (Ficus carica), peaches, cherries and pomegranates. Plums, nectarines and apricots require more careful pruning. Dwarf cultivars are easier to train than standard size trees. 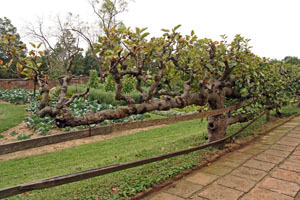 But almost any woody plant with long flexible branches can be used for espalier. Ornamental plants such as bougainvillea, camellias, cotoneaster, flowering crabapples (Malus), flowering quince cultivars (Chaenomeles), forsythia, holly, magnolia, Pyracantha, Pfitzer juniper (Juniperus chinensis ‘Pfitzerana’), some viburnums, winged euonymous, and witch hazels (Hamamelis) are quite amenable to espalier. Even climbing roses could be used. 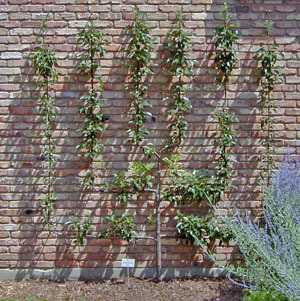 There are six traditional patterns used in espalier, with many variations on these basic designs. Normally only a single design is used within a landscape. Cordon – the most traditional form in which branches are trained to grow horizontally out of one central trunk. A single cordon is known as a “rope.” A multi-tier cordon generally has three tiers of branches but could have as many as five tiers. Cordon espaliering can be used to form living fences or to increase yield in small orchards. Palmetto Verrier – branches are shaped into a U as the horizontal branches are turned up at the ends. This creates nice definition between trees planted against a wall. Fan – branches angled at 45° grow radiating from a central trunk in a fan-shaped pattern. This is best for spaces requiring vertical coverage or in square spaces. Candelabra – several vertical branches arise at regular intervals from a low horizontal branch coming off the central trunk, forming a candelabra shape. Informal – more naturally shaped, but still in a single plane. This requires only simple pruning. Belgian Fence – three or more V-shaped espaliers are woven together into a fence for a lattice effect. The two trees on the ends are modified Vs for finished ends. The traditional cordon (L), fan (C), and informal (R) styles of espalier. 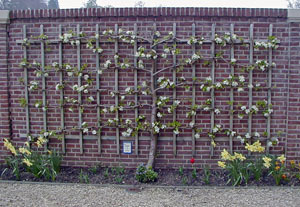 Belgian fence of pear at RHS Garden Wisley, England (L) and Sargent crabapple (Malus sargentii) at Minnesota Landscape Arboretum (C and R). The different patterns are created by pruning to remove unwanted branches and training (forcing) others into the desired position. The highly symmetrical, formal designs require much more effort than the informal types. 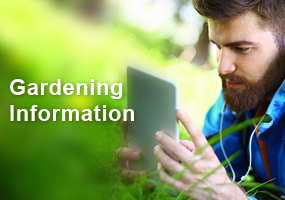 Some plants or cultivars are more suited to certain patterns than others because of their natural growth form, so will require less effort to train and maintain if well-matched. The more complex patterns take longer to develop. Some nurseries offer pre-trained trees that already have a basic shape if you don’t have the patience to develop your own espaliers. Espaliered tree at Palais Het Loo, Netherlands. Espaliers are trained on a strong supportive form of wood or galvanized wire. Almost any flat surface can be utilized: a wood or chain link fence, brick walls, the side of a garage, home or other building as long as a support structure can be attached to it. Free-standing trellises or even just wire stretched between posts can be used can be used independent of a flat surface. The tree should be at least 8” from the flat surface to allow for growth and air movement. Supports are placed in specific locations depending on the pattern and the plants are pruned and tied to the supports as they grow. 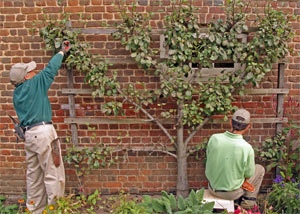 Espalier requires dedication to pruning to develop a beautiful and productive tree. Espalier is a long and labor-intensive process, so this really isn’t suitable as part of a low-maintenance landscape. The basic framework of simple designs may be established in three or four years, while intricate designs will take longer. To develop your own espalier, choose a young tree without much branching, as this will require much less effort to manipulate. The main pruning is done annually in late winter/early spring when the plant is dormant (or after it flowers, if it is a spring bloomer) to remove branches that don’t fit the plan. Growth is redirected by pruning to buds that face the direction you want the plant to grow. Branches are moved into place and tied onto the supports in spring and early summer, while branches are still young, soft and easy to manipulate. This often has to be done gradually over a period of time each spring. 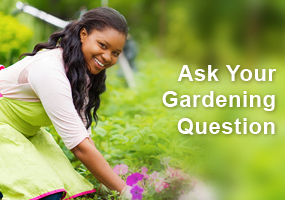 The ties – of soft string, strips of rags, rubber grafting bands, plant ties, or raffia – should be checked periodically (every few months) and loosened if restricting growth or damaging the branch. The ties are removed once the final form has been achieved. Once the desired overall shape is achieved, it is maintained by simple, minor pruning once a month to remove all stray branches and twigs that are growing perpendicular to the flat plane or out of the pattern. Specific directions for pruning the different patterns can be found in various books. 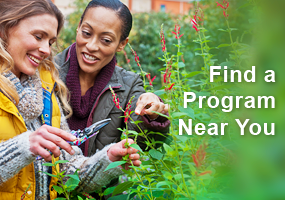 Shape the plant every month or so, removing branches or twigs that aren’t in the correct plane of growth. Maintenance for espalier plants is the same as for normal plants of their type, except for the more intensive, regular pruning and shaping (which never ends). I knew this technique could be used with vines but the tree technique was quite interesting. I have a large southeast facing Landon stone wall that I would like to try an espaliered fruit tree on. My choices would be pear or a ‘Juliet’ cherry tree. This information will certainly come in handy. This is interesting. Having been to the Netherlands last fall (2016), I missed looking for Espaliers. I hope to go back,so I will look for them, then. I also grapes were not noted. Are grapes that are tied, considered to be espaliers? I would love to try this, as we have many home fruit trees, growing together in an “orchard setting”. It might be interesting to try with a fig or speciement type fruit on the side of our garage. (South facing). Have always wanted to try this with pears but don’t know if I can devote myself to this labor intensive process. Didn’t realize there are so many options with espalier design. Beautiful! Great article! Would love to add to landscaping around a new house. I like the idea of trying more non-Hardy cultivars with the added protection of a brick retaining wall.